So you would like give Taekwon-Do a try? 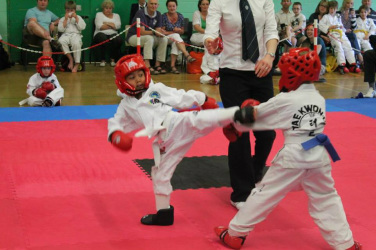 New starters are always welcome at Swift Fox TKD. Please come along on any training night and introduce yourself to one of the black belts. We recommend you wear loose fitting comfy clothing suitable for exercise as we hope you will want to join in. You will also want to bring a bottle of water with you. What can you expect on your first night? There is no typical training night as we try and keep the content fresh and exciting. We also listen to our members and will help them meet their own personal goals. What happens if I want to join? If you decide to join then we will provide you with some paperwork for your parent/guardian to complete. This is part of your licence which forms part of the insurance and accreditation process of the club. Most students will purchase a Dobok (training suit you see in the photos) after a few weeks. As you progress and want to further your training you will need to invest in some other equipment such as sparring pads. These are required for competitions.